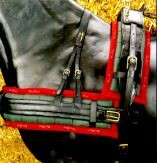 These pads are designed to help alleviate any pressure points created whilst working in harness. 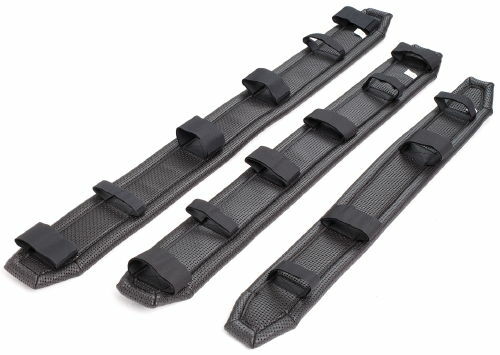 The Driving Roller Pad and Breast Collar Pad are fitted with Velcro straps to locate them onto the harness. Colours include black, royal blue, navy, forest green, red, maroon, purple, brown and white with matching or contrasting binding. Driving Roller Pad - 18"
Driving Roller Pad - 28"
Breast Collar Roller Pad - 36"
Breast Collar Roller Pad - 42"
Breast Collar Roller Pad - 48"
Easy to wash, this pad is suitable for use under driving saddles and breastplates to protect the bearing surfaces of the harness and provide protection and comfort to the horse. Colours include black, navy, yellow, dark green, purple, red. white, royal blue with matching binding. Lightweight and easy to wash, this pad is suitable for use under driving saddles and breastplates to protect the bearing surfaces of the harness and provide protection and comfort to the horse. They are made with a Gel-Lite core, covered with cotton upper and a breathable material lining. Gel-Lite has the impact and pressure absorption of traditional gels, but is up to 80% lighter. It features touch-tape straps that make the pad easy to fit and remove for clearing. Black only. This pad features a hard-wearing nylon outer, fully bound with polypropylene webbing. The core is made from memory-foam, a material originally developed for NASA. It has fantastic properties for conforming to the shape of the horse, and for the minimisation of pressure points. Touch tape straps make the pad easy to fit and remove for cleaning. Measures 21cm wide by 100cm long.